Photo by Thomas Marr, via the Boston Public Library’s Flickr stream. 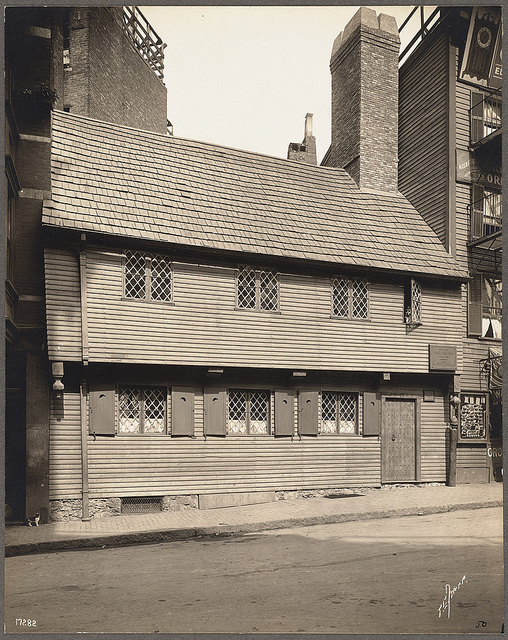 This small wooden house in Boston’s North End belonged to American revolutionary, Paul Revere — the one who went riding to Concord to warn the original “patriots” that the British were coming. But in the years between housing the famous silversmith and becoming a shrine to revolutionary history, the building housed at a various times a cigar manufacturing operation, a bank, and a vegetable market. The North End, an old neighborhood in an old city, had long been a point of arrival for new immigrants. So after Paul Revere sold the building in 1800 it became a tenement, and the first floor went commercial. By the latter half of the century, the new arrivals to the neighborhood would have been mostly Jewish and Italian. From 1880 to 1905 the neighborhood went from 4% to 80% Italian. That’s what we call a boom, and you can hear it in the names of the Revere house’s late tenants: the FA Goduti and Company Cigar Factoryand the Banco Italiana (1905 photo). The vegetable shop was apparently Jewish. It’s now the stuff of high school history class discussions that it was Longfellow’s 1861 poem, “Paul Revere’s Ride,” and not Revere’s own life, that posthumously made him an American icon. Architect and preservationist Joseph Everett Chandler championed the restoration of the Revere House in 1907 for the Paul Revere Memorial Association. His renovations included knocking off the building’s third story (I would love to see more of Chandler’s thinking on the renovation if anyone’s seen some primary docs). This all took place just two years before the photo above was taken by Thomas Marr. He was a society photographer who took pictures of many of the most notable people and places of his era. This entry was posted in Architecture, Boston, Colonial Boston, Images and tagged Henry Wadsworth Longfellow, Joseph Everett Chandler, North End, Paul Revere, Thomas marr. Bookmark the permalink.